Nelle Pierson at the 2012 National Bicycle Summit. Photo from the League of American Bicyclists. 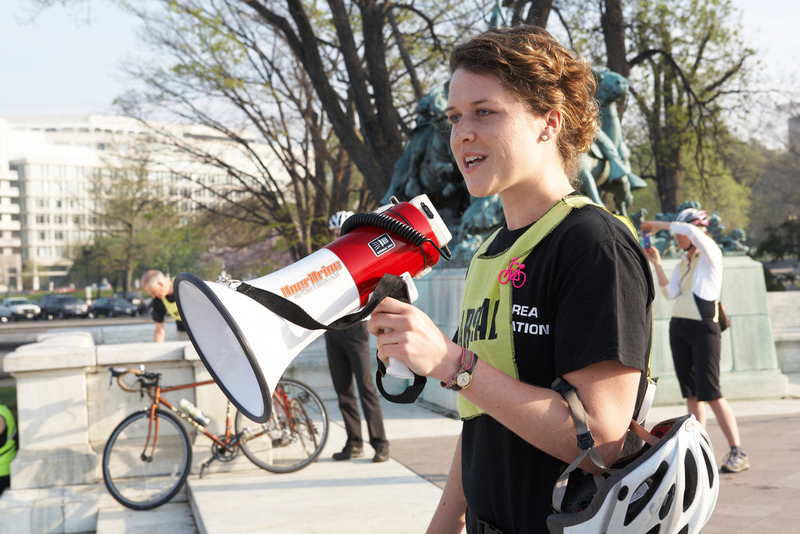 Washington Area Bicycle Association (WABA) Outreach Coordinator Nelle Pierson is only in her mid-20s, but she’s already making a big impact in the bike advocacy world. 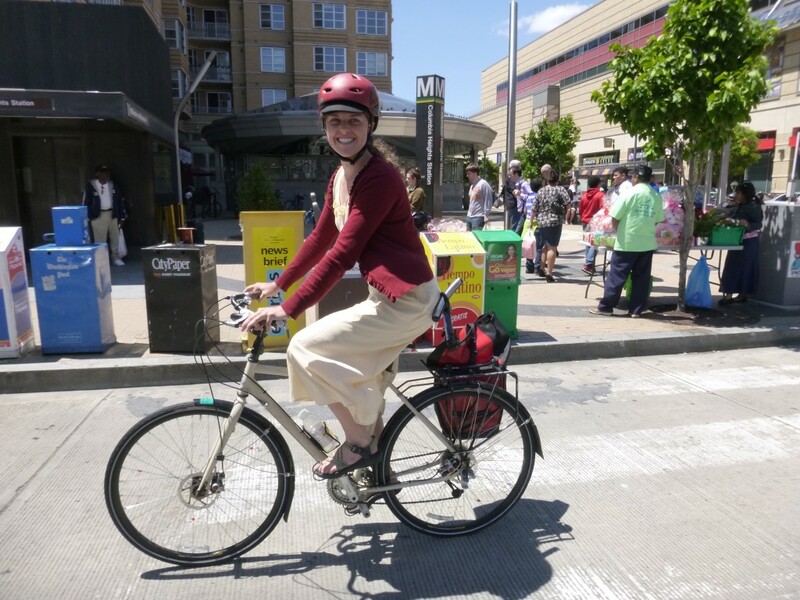 The Alliance for Walking and Biking named her Advocate of the Year at the 2014 National Bicycle Summit. 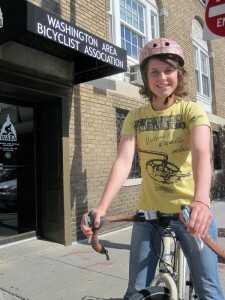 Bicycling Magazine recently listed her as one of 14 bike advocacy innovators. This is in large part thanks to the work she’s doing with WABA’s Women & Bicycles Program, which she launched and continues to spearhead. Through it, Pierson is working to get more women on bikes and help narrow the pervasive bicycling gender gap. We discussed her work with WABA and the Women & Bicycles Program, her quick rise in the advocacy world, her long history with bikes, and some of the underlying issues of the gender gap. What does your job with WABA entail? I am WABA’s outreach coordinator. I run and founded the Women & Bicycles Program. I run suburban outreach, where we do a variety of outreach activities in the suburbs outside of DC. We work with all mode users, encourage people to ride bikes, and encourage people who do ride bikes to ride safely and have fun. I help oversee our DC bike ambassador program, the East of the River Program, which is our equity and diversity initiative. I’ve been with WABA for almost three years now. The advocacy world is certainly taking notice of your work. How did it feel to be named Advocate of the Year and listed among advocacy innovators? It feels unreal. When I graduated from college in Colorado, I’d become so immersed in bicycling. It had taken over so much of my social life. I studied environmental policy and political science in school and I saw biking as the most effective, low-hanging fruit to work on all these problems I just started to care about. I graduated and I wrote in my little time capsule, “five years from now I want to be a bike lobbyist.” I really had no idea what that meant, I just wanted to be involved in the process of getting more people on bikes and making cities safer and more amenable to people who ride bikes. To think that in such a short amount of time I’ve been able to dive into this field that I didn’t even really know existed, but dreamed about, it’s unreal. I love my job. So much of this recognition come from the program I launched, the Women & Bicycles Program. The stars aligned, people came out of the woodwork at the right time, the conversations happened in certain ways. It was serendipitous. I feel so lucky to be in the right place where those things were happening. How’d you get from that graduation time capsule to where you are now? What was your path to WABA? I went to school in Fort Collins. Two weeks after I graduated, I moved to DC. I got an internship on the Hill, I got pretty lucky. I interned for the House Appropriations Committee and got to see how bills were passed and how the government works. After that I interned at UDOT in their bike ped program. I got to see how sketches of bike lanes got put into the ground, see how the public policy around biking actually works. By that time I had gotten pretty involved in the local bike coop and was volunteering at WABA. A position opened up and I didn’t even really apply for it. The Executive Director reached out to me and asked me for my resume and to come in for an interview. So again, I feel so lucky to have been in the right place at the right time and to have been involved in activities where people were noticing me. What got you into bikes in the first place? I grew up in the suburbs of Denver. I started riding bikes when I was five or six. Like most of us, it was my way of getting as far away from the house as I could on my own. I had pretty lax parental rules, so I would come home from school, hop on my bike, and go play in the ditches and creeks and lakes with my friends, then ride back at sunset. I was my own free-spirited adventurist. Then as a teenager I got pretty enamored with car culture. I remember counting down the days from my 15th birthday to my 16th til I could get my Jeep Cherokee. God I loved that car. It was another form of freedom in the giant, suburban megalopolis of Denver. You can’t really have the same lifestyle in a place like that if you don’t have car. When I went to college I was still in love with my car, but I realized I couldn’t afford to keep up with insurance and gas and still pay my student loans and rent. I gave the car to my dad and my mom bought me a $50 pawn shop bike. A Free Spirit. I was one of those kids who never even thought about buying a helmet or lights or a lock. I just rode. Looking back on those college years, I’m glad to be alive. I did some really stupid things on a bicycle. Anyways, I started making friends through biking. I hung out with kids who did alley cats, kids who were in the race scene. But mostly we would just bike around for fun in Fort Collins, which is such a cool bike town. I got involved in student government and was known as the crazy bike lady. I was trying to promote biking all over the place. It made so much sense that we should refocus our understanding of transportation and do whatever we can in dense environments to get people on to bikes. I took to it really quickly. Its definitely part of my personality. I find one thing that I’m excited about and I get really obsessive with it and that happened with bikes. In doing research for this conversation, I came across a claim that you coined the term MAMIL (Middle Aged Men in Lycra), a term some people use to describe the dominate demographic of American bicyclists. Is this true? I used the term during the first National Women’s Forum. I certainly did not create it. I can’t take credit for coining it. But I was the first to publicly mention it in a way that was documented and it just took off from there. I don’t remember where I first heard it. In that vein, the Women & Bikes Program you started is working to help shift the demographics of bicycling. Tell me about the program. Our mission is to inspire more women to bike by building a community of women who already bike and encouraging them to share information and support and use personal networks to bring their friends into the fold. In DC, we were missing a central place for people who just wanted to start learning about biking. Certainly WABA had those resources, but it was never branded as “so you want to start biking, here’s what we recommend.” The program is essential for initiating the conversation on the women’s bike movement. Until the gender gap problem is addressed, until it’s mentioned out loud that there’s this really absurd statistic that only 24 percent of bicyclists are female, then we won’t figure out ways to address the problem. We held our local women’s forum back in 2011. We gathered feedback, anecdotal information about why people thought less women ride bikes and their specific experiences and observation. The barriers to riding fell into four different categories: infrastructure, perception, logistics, and miscellaneous. Infrastructure is an underlying issue. The more infrastructure we have that’s pro-bike friendly, the more all people bike. Infrastructure addresses issues of safety. Safety is most frequently cited as the reason people aren’t biking. That leads into the perception category. Because most of the people biking for the last hundred years have been male, it’s perceived as this athletic and competitive thing. And that’s not just the people you see on the streets, but the way it’s portrayed in the media. We have an obsession with biking as sport, or least that’s how it has been. The more we can take a look at our marketing materials and include people of all ages, shapes, sizes, genders, the more biking seems accessible to the general public. The third category is logistics. How do I pack, what gear do I need, what gear will help me show up to work looking professional? The final category is kind of a miscellaneous category. I’m not the best at talking about it, because I’m not a gender studies major, but this miscellaneous category is about the way we’re socialized as women to make transportation choices and the way men do. Women are still twice as likely to be taking trips from home that involve children. So mothers have such a burden when it comes to making the giant leap to becoming bike commuters or using bikes to run errands. After gathering this input from our forum, we designed the program to try and address the issues head on by building online and offline communities. We have a closed Facebook forum with about 1,300 members now. It’s a place for people to share ideas and tips and tricks. I do a weekly poll to get everyone’s feedback. Safety issues come up. Women’s issues such as periods and bras, being mothers and biking. It’s been a really good way to create an online community. Then we create an offline community through rides and workshops. We’re building this peer-to-peer support network through the program and it’s worked so well. How does the Roll Models component work? Another big and successful part of the program has been our mentors, the Roll Models. We had 10 this past year. They’re women who volunteered to be mentored to other women in their lives, their friends, peers, coworkers, to get them on bikes. Women volunteered to be a mentor and we hosted a bike dinner party at their houses. Chipotle sponsored with burritos, we’d bring beer. It’s just a big, fun, lively bike party. Our target is that 60 percent that identify as “interested, but concerned.” It’s designed to address and work through the concerns of those riders. It’s been really helpful in breaking down myths about bicycling, answering specific questions people have, and talking to people who don’t know what they don’t know about bicycling. That aspect of the program is working out extremely well. It creates a trusting relationship that’s ongoing beyond the first Roll Model workshop. The women know there’s someone out there to answer their questions. The participation of the mentors varSome Roll Models have taken their groups to bike shops, lead group rides. We had one gal who did her meetup through her church and worked to get her group ready for the big church ride. The level of participation varied between mentors, but the underlying relationships between people is what has made this program work so well. It’s not just strangers coming together. You make friends and make connections and have on going support to keep riding. The program is clearly off to a successful start. Where do you go from here? One of the questions we frequently get is how we can continue to involve these new voices we’re bringing in to the bike movement. We’ll continue to focus our programming and a good 30 percent of our programming on advocacy. And with that, we’re going to keep trying to make advocacy fun. Going to a public meeting to talk about bike lanes is one of the most dreadful things to do. It’s no wonder it’s hard to get people to speak on behalf of bicyclists. This year we tried to get more women into public hearings and advocacy meetings by hosting happy hours beforehand then attend the meeting all together. During the happy hour we would talk about the upcoming meeting, about what to say. Then you feel prepared and like you have a strong support group with you when you go into the meeting. I think it could bring more people out of the woodwork to participate in the public process. We’re also going to host more Infrastructure 101 workshops. We brought in a traffic engineer she talked about different bike infrastructure. We’re arming people with information. You may not have ever noticed bike boxes on the street and thought about their advantages, but if you know what they are and notice them you can ask for more of them in the city. Beyond that, we’re going to continue focusing on diversity. The majority of our participants so far are young, white women. And it’s great that we’ve had so many people participate in the first year of the program. But we need to diversify our voices so we don’t perpetuate inequities. 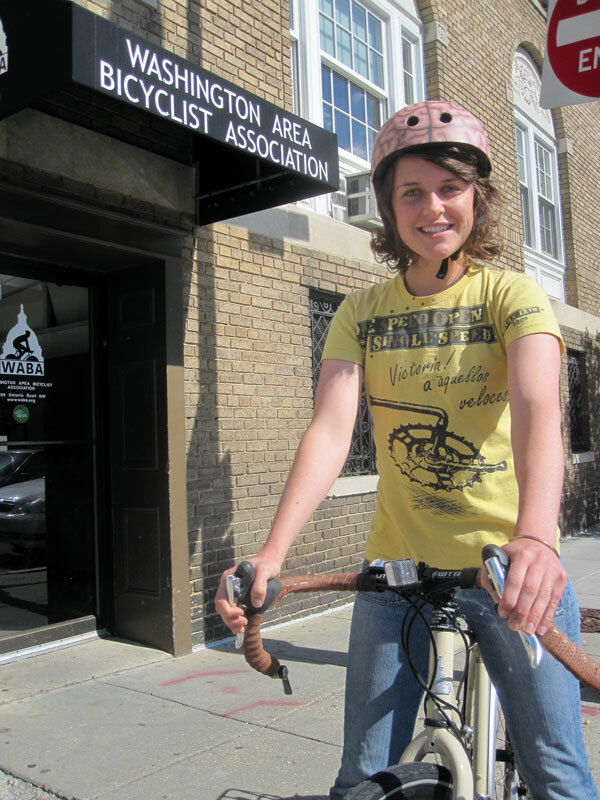 This entry was posted in Advocacy, Interviews and tagged advocate of the year, bicycling gender gap, cycling in washington DC, nelle pierson, waba, washington area bicycle association, women and bikes. Bookmark the permalink. This is an amazing description of how politically-smart activism can work, starting at grassroots level. Well done Nelle! FYI – MAMIL is a well established acronym in the UK. According to Wikipedia, the term was a brainchild of a British marketing research firm in 2010 but I think it had been around even before that.